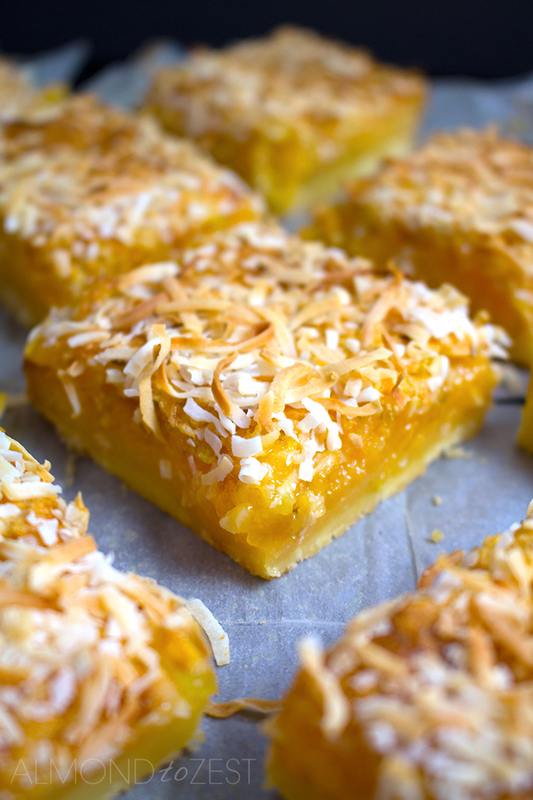 You will fall in love with these zesty little pineapple, lime and coconut summery styled squares. It is just so damn cold down here in little NZ at the moment. And wet!!! Our poor dogs, Rip and Jester, just stare out the window hoping for a day of sunshine so that they can go out, stretch their legs and maybe get a shot at playing ball. Even when our backyard looks dry enough for a game of ball, the result after the first slide is always a regrettable moment. Talk about a mud bath. Our seven rescue cats are subjected to living within the four walls of their converted garage. Yes, you did just read that correctly. The cats basically have their own home. And the only ones in our family that don’t really mind the wet weather are the fish. I mean they live in the stuff, right? In my opinion the only cure to mend the winter blues is to put on an apron, turn on the oven and whip up a summery treat. Which is why I decided to bake these beauties and share them with you today. 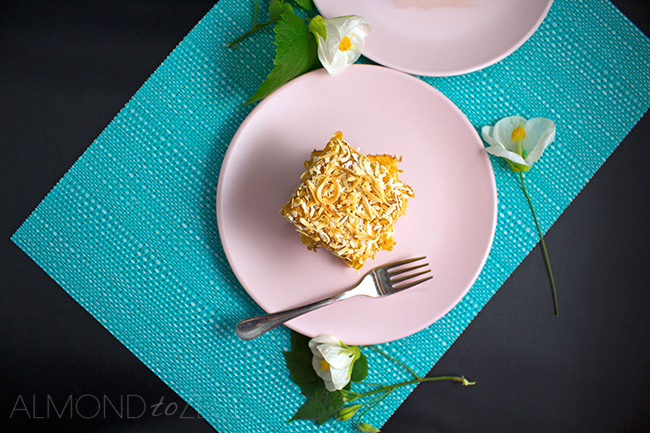 This summery bar is a recreation of our most popular recipe post here on Almond to Zest. Our PINEAPPLE, LIME AND COCONUT MUFFINS. And because you guys love them so much I decided to give you a new recipe to play with. 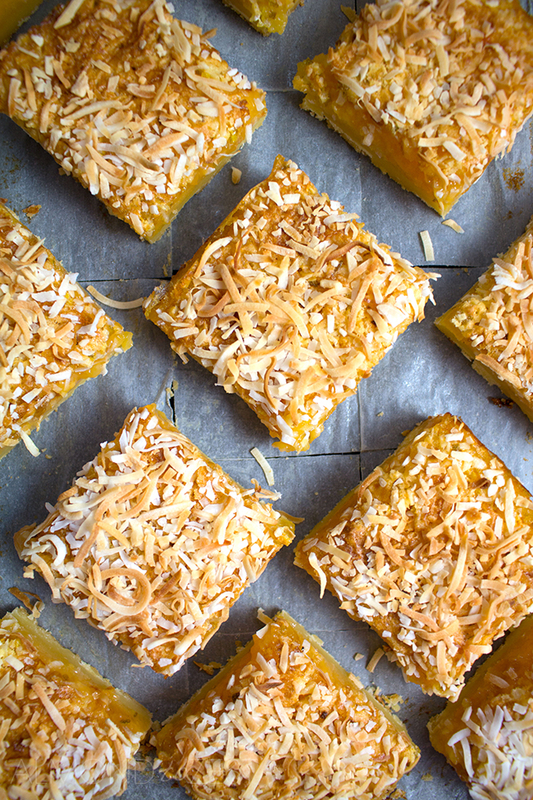 These scrumptious little tropical squares have the most amazing texture. 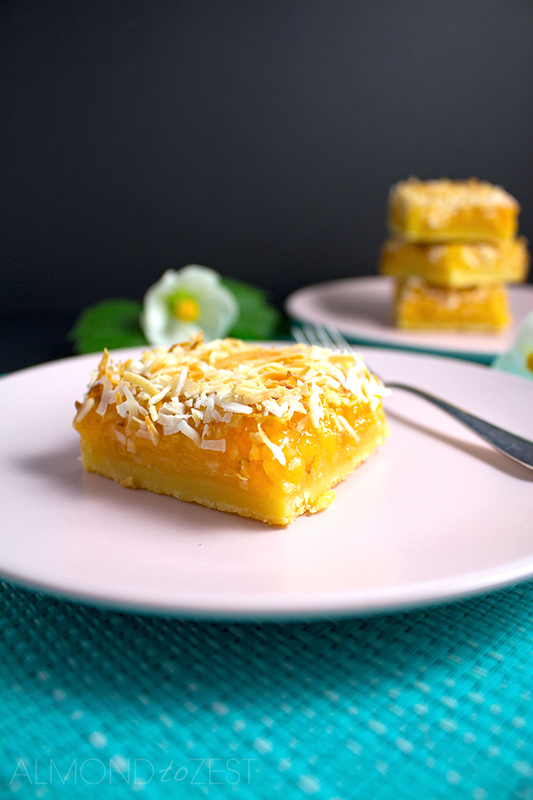 It starts with a short crumbly base, that gets topped with the soft and gooey, zesty pineapple topping that is scattered with dried coconut for that crunch factor. And the flavor of this bar is to die for. The sweet pineapple and fleshy coconut combined with the zesty tang of the limes is spectacular. And although similar in taste to the muffins this bar is a bit sweeter from the gems of crystallized pineapple that are in the filling. This tropical bar is so super easy to put together. And are a sure thing to melt away those winter blues. Especially when warmed slightly and served with a scoop of ice cream or Greek yogurt. Check out how interested this little guy is in the making of these bars. Hahaha, he has such a sweet tooth. Who am I kidding? Any kinda food will do for this guy. But no seriously Rip really, really loves sweets. 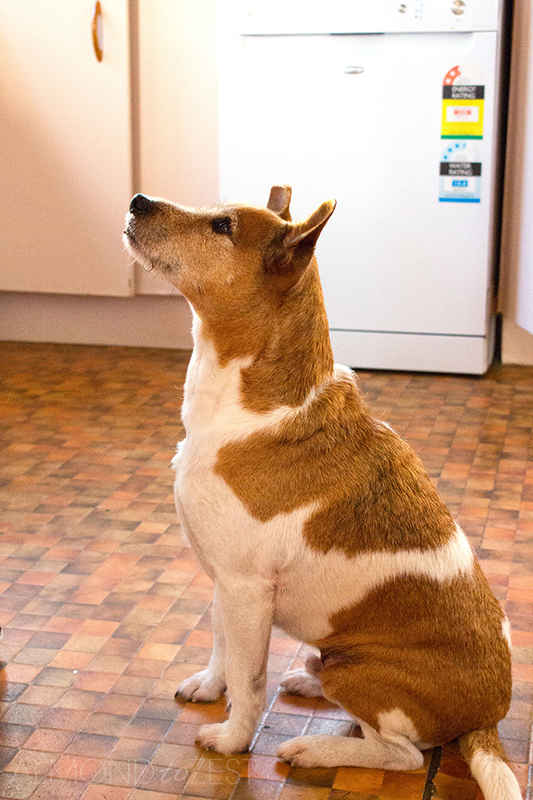 He even gets the full body shakes on when he knows something good is getting put together on the kitchen bench. Well I hope you guys loves these bars as much as I have loved creating them for you. And as much a Rip has enjoyed licking all those random crumbs off the floor. Heat oven to 350 (180C) and line a 11” x 7” baking pan or similar with parchment paper. Allow some paper to hang over the long sides. Place the flour, butter and icing sugar in the bowl of a food processor and process until the mixture resembles fine breadcrumbs. Spoon the mixture into the baking pan, spread out evenly and press down with the back of the spoon. Bake in the oven for about 12 minutes or until lightly golden. Take a mixing bowl and add the eggs, caster sugar, zest, lime juice, baking powder and ¾ cup of coconut flakes or desiccated coconut. Whisk together until well combined. Pour the mixture over the base and sprinkle the dried pineapple evenly over the top. Return to the oven for another 10 minutes. 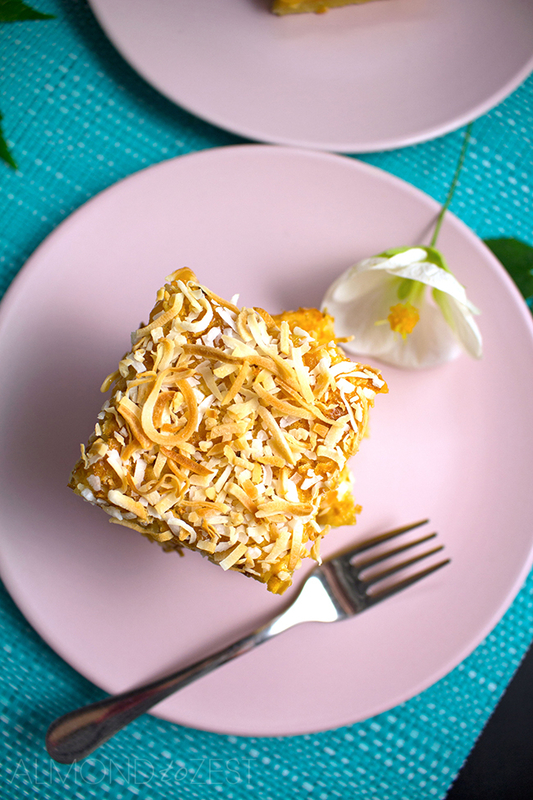 Sprinkle the remaining ⅓ cup of coconut flakes or desiccated coconut over the top and continue to bake for another 10 minutes or until golden brown and just set.